A Yogaville resident paints a picture of the Lotus Shrine, an interfaith temple located on the ashram's man-made lake. Swami Priyananda stands under the arch that welcomes people to the Lotus Shrine. One of a series of quaint homes on the narrow winding road to Yogaville. Where would you go when you're running out of money? As the economy continues to sputter, I've turned this question into a hypothetical game of sorts. At gatherings held by my (mostly unemployed journalist) friends in Los Angeles, a city where the jobless rate now stands at 20 percent, we'd rank the obvious options: parents' house, friends' futon, military. Then there are the less obvious options: laboring on an organic farm, joining a couch-surfing organization. Eventually silliness gives way to anxiety, and the players with the least amount of money turn cranky. When my friend Bob Helmick, a tattoo artist and stagehand, arrived from San Francisco, I introduced him to the game. He'd moved to L.A. to find more affordable housing but was finding it hard to impress landlords while "in between" jobs. The situation was killing his optimism. "You get cut down; that's life. You go out on the streets, eat trash, sleep in a box and die, " he offers. "Or you lift your bootstraps up and keep trying and trying and trying. Those are the options. Period." I wanted to prove him wrong; there had to be some place where you could live peacefully, free of financial anxiety (without destroying your friendships and/or tent). After I made the cross-country move to D.C. about a month ago to keep my job, I kept thinking about this. And then I remembered hearing, years earlier, about Yogaville. Founded in 1980 by world-renowned Indian spiritual leader Sri Swami Satchidananda, the Yogaville ashram was never intended as an alternative to homelessness. But at 0 (or less) a month for three vegetarian meals a day, a dorm room and all the yoga and meditation classes you desire in exchange for a couple of hours of daily chores, the price is hard to beat. 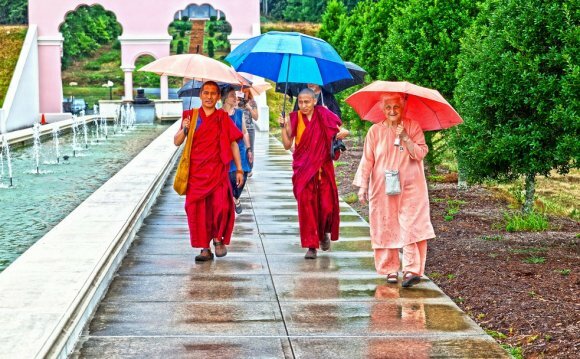 Yogaville is located about four hours outside D.C., amid the farms and McCain bumper stickers of rural Virginia — not the first place you might expect to find a 1, 000-acre interfaith yoga community. An orange arch with the words "Truth is one, paths are many" signals you're almost there. Swami Priyananda, who runs the work-exchange program known as Living Yoga Training (or LYT), greets me at the main hall. She says the work-exchange program was started to show people what it's like living as a yogi. "We basically scaled down our lifestyle so they can get a taste of it, " she explains. Real yogis meditate three times a day, for example; LYT participants are required to give it a go five times a week. There's no credit check and no competitive interview process. Priyananda says she's simply looking for people who are serious about yoga and contributing to the community. If you're down on your luck, that's OK. Perhaps that's partly why this winter, the ashram had a record 17 participants. "There's been an amazing surge in interest in the past few months, " she explains. "Whether it's due to the economy or something else, I can't be sure, but we are happy." Hale Schneider, of Richmond, Va., is one of two students who found their way there after being laid off. "I was a business analyst at Circuit City, and then the whole company got shut down and we all got laid off, " Schneider says. While his former employees have been looking for other work, he's been learning to meditate, working in a vegetarian kitchen and "getting centered, " as he calls it. "Back in Richmond, when people found out you were laid off, people gave you sympathy, " he says. "But when you got here, people were like, 'That's so great! All these doors are going to open up for you.' It's a totally different dynamic." The hardest part, at first, he says, was parting with beer, but he's adjusting to the lifestyle. So is fellow participant Amanda Noah. A year ago, she was working for a mortgage broker, in Butler, Pa., about 45 minutes from Pittsburgh. Now she's attempting the upside-down peacock pose and writing songs about being. "It's nothing like being in an office, that's for sure, " she says. And though she's not making money — she's spending less than she would back home because, as she explains, "there's nowhere to spend it around here." Once I understand better what the ashram life can be like, I take it back to my friend Bob. As it turns out, there are dozens of similar options in California — some of which are even cheaper than Yogaville. But Bob, who has the words "More Beer" tattooed across his knuckles and likens the concept of a work-exchange to indentured servitude, isn't having it. "That sounds like I'd rather take a red-hot iron poker and stick it in my ear than do that, " he tells me. "Even Mexican berry pickers make money; they don't just get room and board."